The Dark Knight Rises Blu-Ray/DVD comes out on December 4th, and while it won't contain deleted scenes or a director's cut, it will be packed with behind-the-scenes features and concept art. And, as we get closer to the release date, a few bits of those extras have ended up online. You can read the entire list of bonus features over at Business Insider, and some of them sound downright fantastic—especially the hour-long documentary about the history of the Batmobile, featuring Adam West. As for what's available online, here's what we've seen so far. If you've spotted any other Dark Knight Rises bonus features, drop a link in the comments. A Girl's Gotta Eat: Anne Hathaway and Christopher Nolan talk Catwoman. Gameday Destruction: How the special effects team blew up the football field. 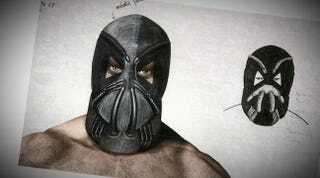 Gotham's Reckoning: Tom Hardy on how he bulked up to play Bane.